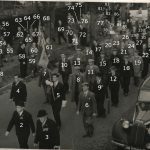 I was handed a photograph of a Remembrance Parade from just after the war. While I am not sure of its date, it is just after the war because some of the men involved served in the war. One man, Bill Linge, is seen at the front, wearing his Military Medal. The prade features men from both World Wars. I am assuming the parade is in the early 1950s, or even the late 40’s, but no doubt it is soon after the end of war. I would appreciate any assistance in identifying anyone from the photo, perhaps from family of those in the parade or those watching the event. I have reproduced this image with numbers next to individuals. 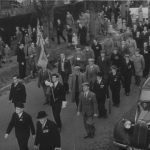 Can you identify anyone from this Remembrance Parade? The image was taken along the London Road, from a window possibly from what used to be G&I Autoparts, but is now the Starfish chip shop (as of Oct, 2013). List of names – Please email me a number and name if you spot someone here who you think you might know.